Students who are admitted, readmitted, or who transfer into the UNA College of Business will be classified as 'Pre-BBA Students'. Students pursuing a Bachelor of Business Administration degree must apply for Admission to the College of Business major program after completing 45 semester hours of required courses. Pre-BBA students who are not admitted into the COB will not be allowed to enroll in junior/senior level business courses. Students majoring in a field outside the COB but who declare a business minor will be granted a variance from this policy and may enroll in junior/senior courses after they have completed 45 semester hours, assuming they have met any course prerequisite requirement. During the 1st 30 hours following admission into the COB major, students must complete all remaining general studies courses and sophomore level business course requirements. Specifically, the following courses must be completed by the end of the first 30 hours of coursework after admission to the BBA major. Failure to complete the above courses during the first 30 hours of admission to the major program will result in suspension of the student’s permission to register for 300/400 level College of Business courses until all required general education and sophomore level business courses are successfully completed. For admission into the College of Business, students must have an overall 2.0 grade point average (on a 4.0 scale) on all work attempted. The application for admission to the COB may be submitted online from the COB website. The application should be completed after the student has completed 45 semester hours as detailed above. Applications should be completed and submitted online to the COB Student Services Office as soon as the 45 hours have been completed and NO LATER than 30 days prior to planned registration for the junior year of COB studies. Submit application your application here. BBA Minors – The College of Business offers minor programs in accounting, business administration, computer information systems, economics, entrepreneurship, management, marketing, quantitative methods, and real estate and insurance. 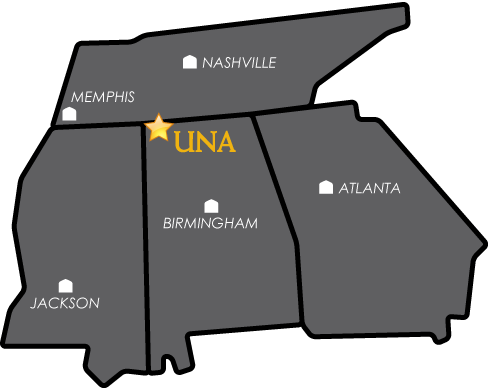 See the UNA Undergraduate Catalog for information about available minors. BBA undergraduate checksheet for more information about course selection.